Transcribing a path though changes in light, sound and ground. The performer’s body becomes something between an expressive artistic tool and a medium, embodying qualities of both camera and canvas. Generating a conceptual feedback loop by documenting and describing the environment’s history, architectural features, and inhabitants while simultaneously inhabiting and becoming new history and architecture. Premiered as a part of "Pattern Languages" and exhibition curated by Kate Hackman at Rockhust University's Greenlease Gallery, September 2017. Shown at Long Winter Arts, Toronto, ON, November 2018. 481 falls is a video collaboration by choreographer and director Jane Gotch and cinematographer Elizabeth Stehling. With a desire to observe emotional patterns within the human form, the artists document sixteen people in the act of falling. The piece is a 12-minute loop of continuous, arrhythmic, slow motion falling structured to create an environment on and around a gallery wall. While in the physical act of being off balance, in falling, our primal nature comes to life. For gravity does not discriminate, everything with mass, all bodies are subject to its whims. We grab, kick, look down, look up, we reach for some aspect of control, but once in the throws of a fall there is a singular fate, the ground. We have one measure of defense. A choice in our daily flirtation with gravity, we can tighten and cringe or surrender and release. Between these two extremes, lie infinite possibilities. We depict 481 variations. A two week residency within The Museum's Noguchi Court along-side the special exhibition of Janet Cardiff: Forty-Part Motet. 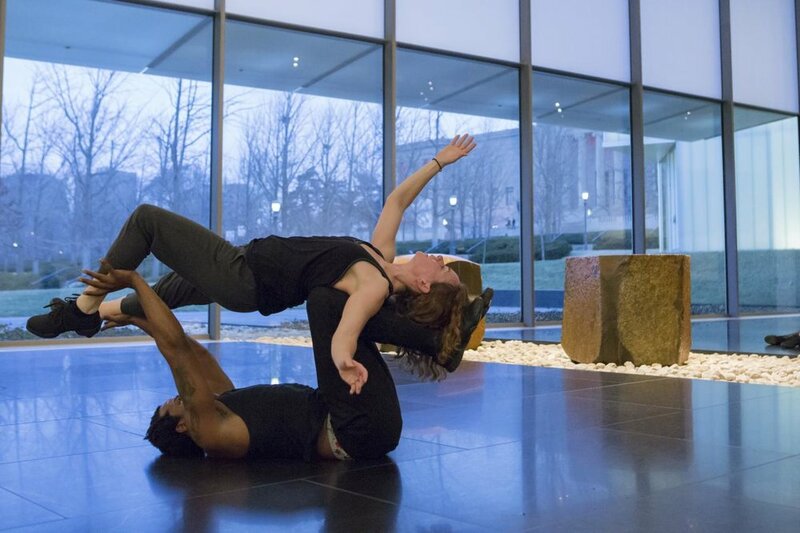 Jane Gotch in collaboration with dancers David Knox, Leo Gayden, Trina Warren respond, embody and merge the indoor/outdoor architecture of the museum, the body-like Noguchi sculptures, and the emotional resonance of Janet Cardiff's legendary sound installation. 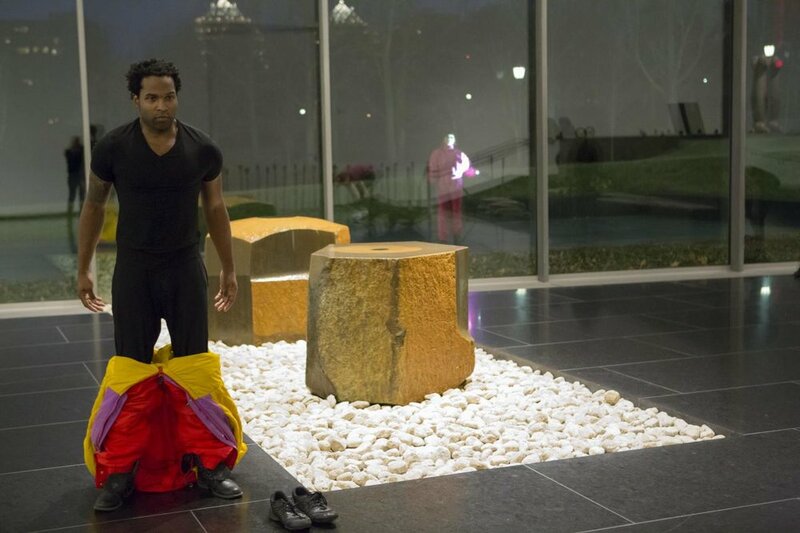 An inside, outside winter performance, the dancers shift a serene sculpture gallery and lawn into an active rehearsal and performance space. Through open to the public rehearsals, adult and children's dance composition classes, and a final performance, the cast explores sturcturing a improvisation around space, audience, sculpture, sound, and their personal identities. October 2015 dancers take over Missouri Bank in the Crossroads of Kansas City. Lead by choreographer and director Jane Gotch, in collaboration with Tuesday Faust, Laura Frank and Susan Warden. Video shot and edited by Tammy Shell. A video collaboration between videographer Johanna Brooks, choreographer Jane Gotch, and artist Peregrine Honig as part of Honig's multi-part installation. The video played on a television inside a hotel room recreated down to every last detail, carpet, bed, furniture, light, and television. Viewers entered room 1801 in twos. Handing over cell phones in order to receive a room key for entry. Each allowed 10 minutes within the installation. The video played on continuous loop during all open hours of the installation. Listen to a radio interview by KCUR. Through abstracted body lines, break dance styling, and operatic song, “Let it fall” imparts a corporeal tale of two people’s relationship with pain. We swallow it, throw it, allow it, and find our beauty within it. The work unifies the artists’ diverse personal histories, into a lush, sensorial saunter down the fine line between suffering and pleasure. Performed by Leo Gayden and Juliet Remmers. After two years of performance and process, Let it Fall concluded with two weeks of sold out shows, August 2105 at St. Mark's Hope and Peace Church in Kansas City, Mo. Jane and dancers returned to NYC February 13th, 2015 for a performance at Roulette in Brooklyn, NY as part of their annual festival [DANCEROULETTE] curated by Jennifer Lafferty. Read an interview with the KC Metropolis about my work and this piece here. 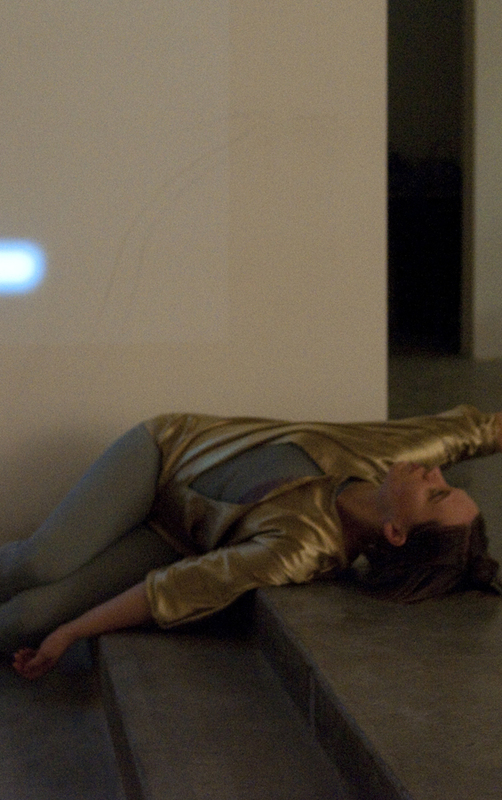 Collaborative duo, Jane Gotch and Shawn Hansen, curate an evening of movement and sound. Presenting their own work and works by: Timothy Amudson, Leo Gayden, Tiffany Siesmore, Master Chun Man Sit, and Neal Wilson. Images above from "Artificial Light" by Jane Gotch and Timothy Amundson. Images captured and lit from 35 disposable cameras given to the audience and additional iPhone flashes. Jane Gotch Perfoirms in collaboration and response to an installation of photography, projection, and sound by TImothy Amundson. The term fugue state is defined as a dissociative amnesia, especially one that involves unplanned wandering. Timothy Amundson expresses that “nothing is actually constant, nothing has been created.” His work is a variant from the representational nature of photography and explores heightened experience, where the unknown is corroborated with references to the everyday. The photographs are immersive and utilize light in ways that question traditional norms of photography. Through this approach there is as much a sense of levity as there is meditational weight. In collaboration with dancer Jane Gotch the more cerebral elements of the images can be explored through the body. In collaboration with Abbey Findley, Katie Ford, Laura Frank, Laura Graham Isaac, and Tiffany Sisemore. Through video, visual constructions, and live movement, the team investigates the human action of sensing. Seeker, Bystander, Sensor and Avoider, a pattern is edge of you interacting with the space. Our creative process will put to practice the research of professor and occupational therapist, Dr. Winnie Dunn — shaping a performance that utilizes each participants (artist and viewer’s) referential world. An integrated art performance installation, directed and produced by Jane Gotch and Mark Southerland. Town Pavillion, Kansas CIty, MO. Performed in collaboration with Brie Blakeman, Brad Cox, Kalen Compernolle, Jason Dixon, Shay Estes, Tuesday Faust, Abbe Findley, Laura Frank, Helen Gillet, Shawn Hansen, Hadley Johnson, Ke-Sook Lee, Chad Meise, Miles Neidinger, Paul Rudy, Matt Tady, and MIca Thomas. WE! is a collaborative, installation dance performance staged in an abandoned downtown office space formerly occupied by AT&T. WE! takes the “idea of audience” out of their seats and into the lights — stripping away the safety net of the proscenium theater and sandwiching dancer, art, and viewer into close proximity. The performance will move the audience, in small groups, through a multi-room visual environment created by an award-winning team of Kansas City’s leading dance, visual, lighting and sound designers. Audience size will be limited, to create an intimate scale. The performers’ breath, sweat, body heat, direct eye contact and even touch will be palpable. From breeching walls and new office trails, to tiny tableaus and remote viewings, this collaborative team reorganizes the materials and inhabitants of the office space. WE! will disrupt and remap the relationship between audience and performer. Creation of this project has been made possible through a Rocket Grant from The Andy Warhol Foundation in cooperation with The Charlotte Street Foundation and The Spencer Museum of Art; by an Inspiration Grant from The Metropolitan Arts Council of Greater Kansas City; and through a space grant from Copaken & Brooks Real Estate. 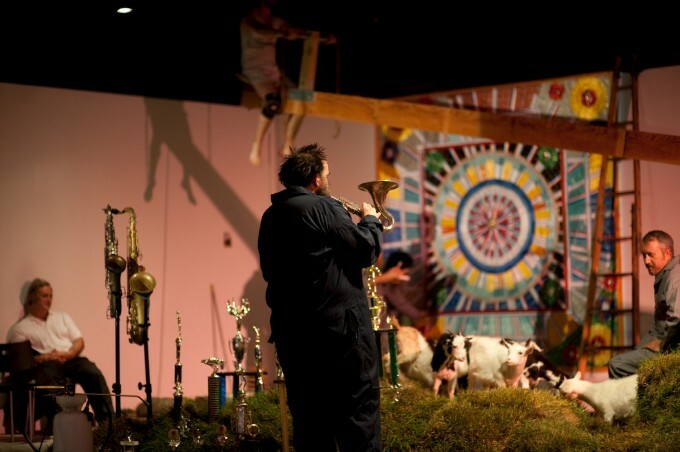 An installation based performance created by Mark Southerland and Jane Gotch. Created and performed in collaboration with Shay Estes, Tuesday Faust, Shawn Hansen, Peregrine HONIG, Mike Stover, Matt tady, Bill Wenzel, and Neal Wilson. Through movement, sound, and installation, SEE SAW will examine the moments when the body meets the mind—self realization, personal epiphanies, and modern coming-of-age stories. Told using an array of tools —often elaborate and abstract; other-times pointedly simple and straight forward—this tale involves a large seesaw and a “trophy playground,” from which music and movement will evolve. Situated in-the-round, the audience itself will become part of the installation and actively engaged in the event. Read a review by David Ollington here. La Esquina, Kansas City MO. Performed Originally at the Lawrence Arts Center, Adjudicated Choreographers Showcase, in Lawrence, KS in November 2009. The creation of “Still Within” was funded in part by an Inspiration Grant from The Arts Council of Metropolitan Kansas City.